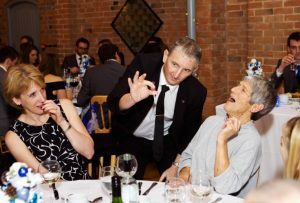 Warwickshire Wedding Magician at Swallows Nest barn. Today I was today back at the fabulous Swallows Nest Barn in Stratford. This relatively new venue is stunning and becoming more popular by the day!! The lovely evening was for Beccy and Matt Dowler.They had booked me after meeting me at an Open Evening at the venue. 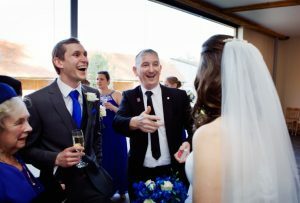 I was booked for mix and mingle magic straight after the ceremony whilst the all important photographs were taken. 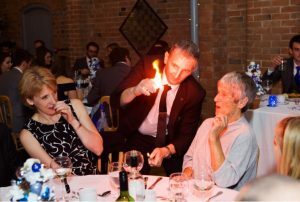 I was then booked for table magic during the Wedding Breakfast. As you can see from the fabulous photos everyone was having a great time. 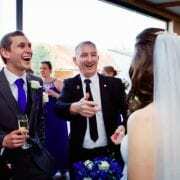 Paul is one of the Best Wedding Photographers in the Midlands region. From his Website..
Ian, a full-time, BIPP qualified Birmingham wedding photographer based in Sutton Coldfield. I provide beautiful, contemporary wedding & family portrait photography in Birmingham & the surrounding counties of West Midlands, Warwickshire & Staffordshire. 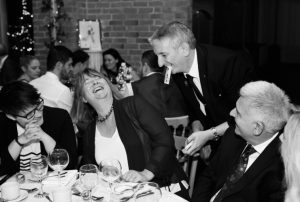 I pride myself on providing a friendly and relaxed service delivering highly polished, professional photos at very competitive prices.